For a bout of fresh air and entertainment activities for kids, head to Hill Garden. Although there’s not a lot to do here for the adults, the garden is good for a stroll while kids can have fun playing on the rides. 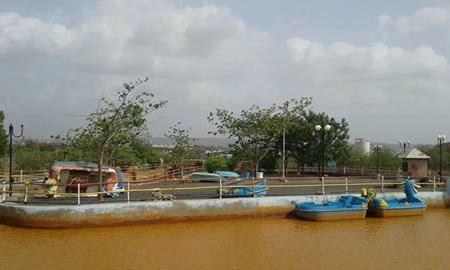 There is a small water park, a boating facility and a small kid’s museum to add to the delight of the visit. Don’t forget to catch the glimpse of the city from the top! Be early if you are visiting the park on Sundays and holidays. How popular is Hill Garden? People normally club together Jain Temple and Kutch Museum while planning their visit to Hill Garden. The garden work is well trimmed Photo Clicked 5 star Shops Item Quality 5 star Price 5 star Enjoyment 5 star includes water slide, train, jumping frog train, faint wheel, water cycling Lighting 5 star Aquarium And Fun Shop Were Closed Ice Cream Was Superb And The Photos Too Cleanliness Good Amount Of Dustbins But still very untidy Scenic view with the trees are superb at night Must visit with Bros, Families, Couples and Kids. The best place to watch a sunset, it's on top of a hill and there's also an aquarium and an amusement park with boating as well. Didn't expect much while going up but turned out surprisingly good. Not what i expected. I visited this garden when i was a little kid. The maintenance is poor for the rides and other stuff. If you ignore that then its a good place to hangout with family.